Lifeboat 7 is the first to be launched. Murdoch gives his commands to crew members who have never made a launch like this. 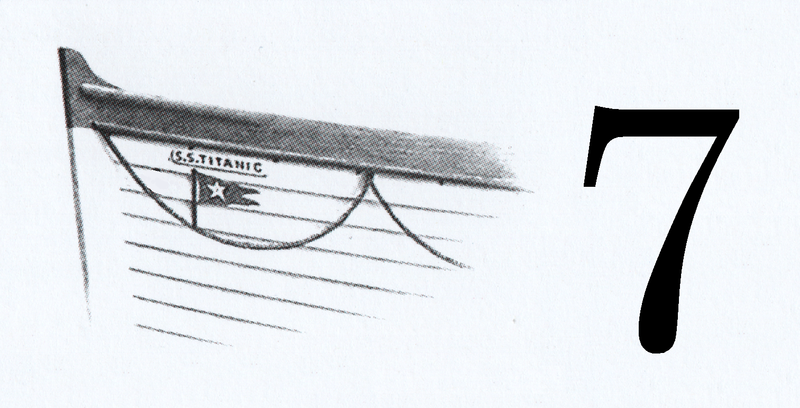 The crew are unfamiliar with the new Welin Davits that hold Titanic's boats. As the lifeboat descends down the starboard side of Titanic, it begins to lower unevenly. Some of the passengers begin to panic in fear that lifeboat will tip over. Murdoch stops, levels the boat, and begins to lower again. Titanic's black wall of steel with her brightly lit portholes slides by. Lifeboat 7 touches the water without even a ripple on the dark flat ocean. Lifeboat 7 is launched with 28 of it's 65 seats occupied.